Are you ready to put your mind to the test? We've gathered twelve tricky but familiar words from the English language and removed one letter. Can you identify each? If you can, your IQ places you as one in a hundred, which is pretty amazing! Just like with any other assessment, you won't know until the end - so prepare yourself. Ready? You ACED It! You're 1 in 100! Well done! You've absolutely aced this test, which firmly places your IQ as 1 in 100 people, let alone your grammatical skills. Congratulations! Not Bad! You've not gotten them all, but close! You did well and obviously have a knack for syntax and grammar, let alone spelling. With this round of practice, we're betting you could give it one more go and absolutely ace it. Close! But no cigar. Ready to give it another spin? 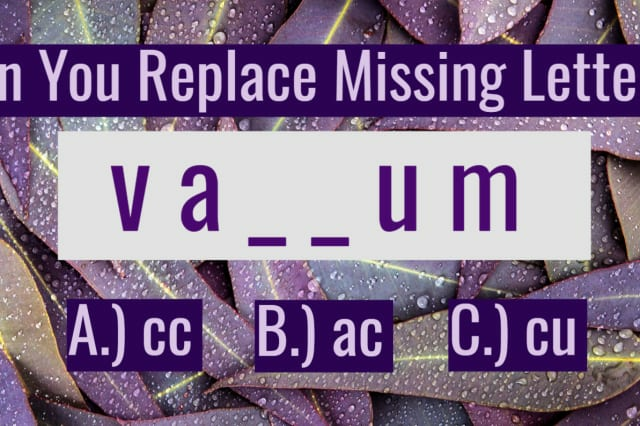 Only 1/100 People Will Be Able To Ace This Missing Letter Test - Can You?